Don’t get fooled again by rising interest rates doomsayers. The yield curve just inverted for the first time since 2007—short term rates are now higher than long term rates. There’s typically a 17-month lag between a yield curve inversion and the start of a recession. The curve did not stay inverted very long further confusing outcomes. Markets tend to perform well during the post-inversion lag period–but stocks eventually draw down when the economy contracts. Stick to your plan. Ignore the media. Buy when things are cheap and take lower but acceptable returns. 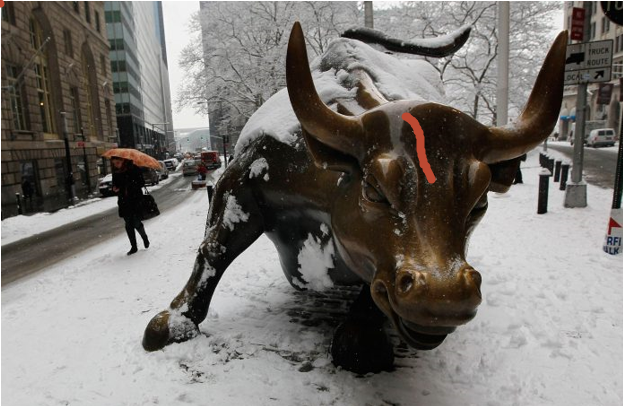 In 2007, I was in China and purchased a statue of a bull for my home office. The statue arrived via FedEx with a crack down the middle. Little did I know that crack would be an eerie warning of the 2008-09 financial crisis—the most punishing global recession we had seen since 1929? I’m not superstitious, but a more traditional recession indicator flashed negative soon after my damaged shipment arrive from the Far East–the yield curve had “inverted.” In other words, rates on long-term (10-year) Treasury bonds were actually paying investors less than short-term (3-month) notes were. As we’ll see in a minute, this phenomenon has happened at least five other times over the past 40 years, and each time a recession has followed. 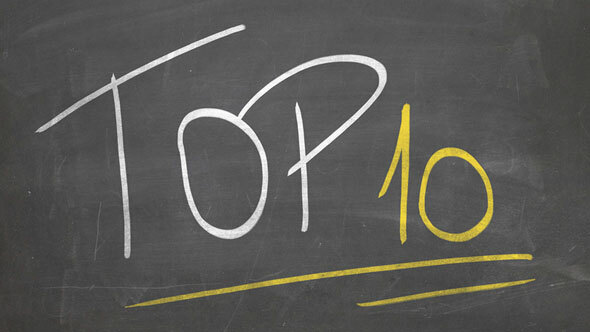 A similar inversion just occurred at the end of March 2019 while U.S. stock markets had rebounded nearly 20-percent from a recent bottom and the bond markets were on a win streak as well. Does that mean another recession is looming? Quite likely it is, but there are some important caveats to consider in terms of timing, severity and what you should do with your portfolio. The markets like life are never easy. First, it’s important to remember that not everyone uses the same definition of “inversion.” Like the San Francisco Fed, I consider it to be when the yield on 3-month Treasuries is higher than the yield on 10-year Treasuries. According to the Cleveland Fed, inversions of that 3-month/10-year spread have preceded each of the past seven recessions, including the 2007-2009 contraction. The Cleveland Fed acknowledged there have been two false positives — an inversion in late 1966 and a “very flat” curve in late 1998. What does the yield curve really mean? The 10-year rate is set by market supply and demand as investors determine the equilibrium point of where that 10-year rate should be. But, the 3-month rate is set not by market forces, but by policymakers at the Fed. As the old saying goes, when investors are scared, they run to the 10-year and when the Fed is scared it raises short-term interest rates. These two forces collide to invert the curve. As a result, when short-term rates are higher than longer term rates, investors are indicating that they’re cautious about the future of the economy and they don’t want to tie up their money. As you can see, there has been a substantial lag from the time of the inversion until the start of the recession in each of these instances. The average number of months was 17, meaning it took about a year and a half for the economic slowdown to hit after the yield curve inverted. Again, history shows that markets tend to perform very well in the initial year or two following an inversion. 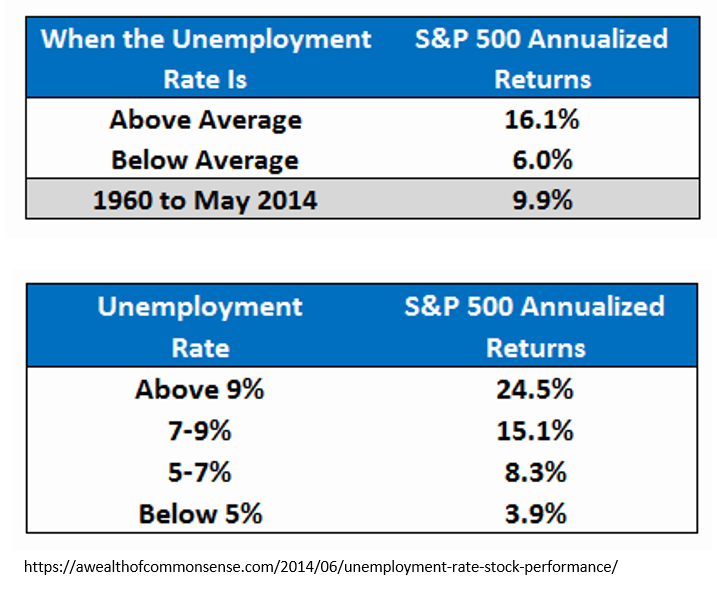 As mentioned earlier, the average return during these lag periods was a gain of more than 15 percent. There was just one downturn which occurred after the dot-com bust in the early 2000s. Although the stock market doesn’t need to see a recession for a large correction, it’s a safe bet that an economic contraction will lead to a draw-down in stocks. Wage growth is still below 4 percent. Inventories are up, but not at recession levels. Bonus factor- the yield curve only stayed inverted for a couple days. Our 4th Quarter Letter encouraged investors to be aggressive and take advantage of the near 20 percent correction in the markets. Over that time, as U.S. market valuations pulled back to median levels, we said the probability of a significant rally following a bad quarter would be quite high (see below grid). We followed that Q4 letter with our first webinar for investors that discussed in greater length the opportunity at hand. As most of you know, the first three months of 2019 ended up being the best quarterly return for the Dow and S&P 500 in a decade. While we can’t avoid a recession forever, we’re not likely to endure a downturn as punishing as we had in 2008. Bank balance sheets are in rock solid shape. American citizens have been cutting debt aggressively, resulting in stronger personal balance sheets than we’ve seen in many years. But we have to be disciplined, because the probability of a cyclical recession is rising and there is a strong likelihood of lower portfolio returns after a decade of euphoria. I am sure you thought this Quarterly Letter’s theme (“Don’t Get Fooled Again,”) would be a warning about the next 2008. It’s actually about the probability of interest rates going higher. 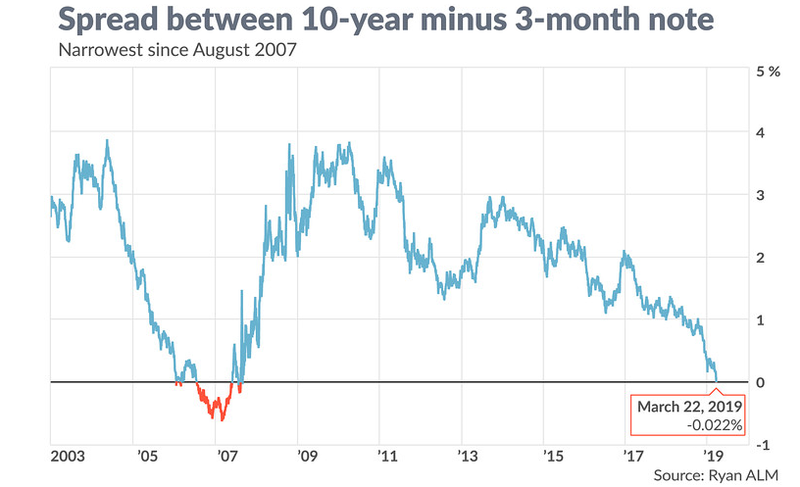 One of the reasons the yield curve inverted is because the Fed was raising short-term rates at a time when the rates on longer term 10-year Treasuries were falling. As I mentioned earlier, short term rates are driven by Fed policymakers, while long-term rate are driven by market forces. 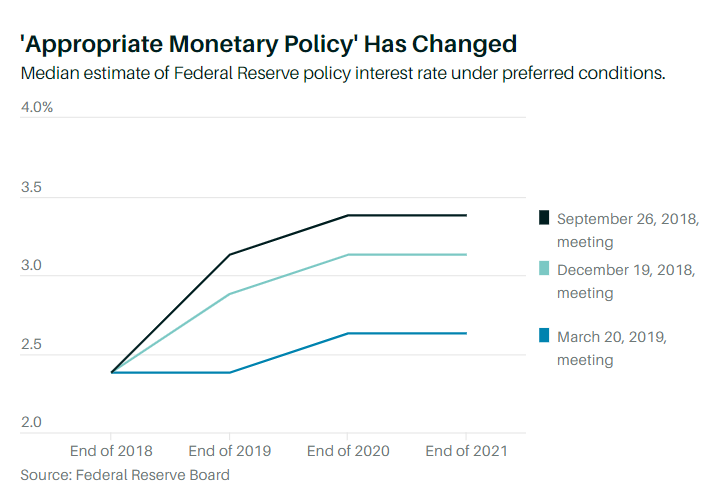 The chart below shows that estimates for rates under “preferred conditions” have dropped from 3.5 percent in 2018 to 2.5 percent in 2019. 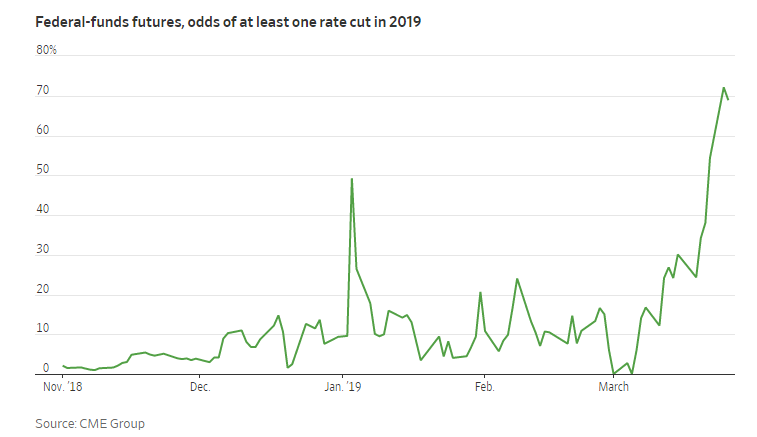 Further, there is ample speculation about a rate cut in 2019. The line has now moved heavy in favor of a rate cut in 2019. As the Wall Street Journal recently reported, yields have slipped as central banks have signaled they are willing to hold rates low for significantly longer than expected. For 25 years, economists have been predicting doom due to rising interest rates. Here we are again with mortgage rates near historical lows. 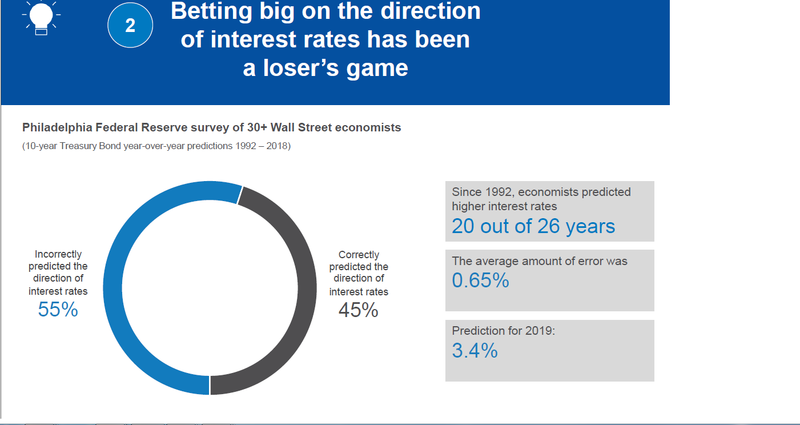 I am already trying to teach my kids that betting on sports is a loser’s game, but an even biggest loser’s game is making bets with your money based on expert predictions about interest rates. “Don’t get fooled again. Since 1992, Economists Have Predicted Higher Interest Rates. How did that work out? If you do not believe me, here are Warren Buffet’s comments from his latest Berkshire Hathaway shareholder letter??? Equity investors have enjoyed a historic run over the past decade, and now it appears we have our first serious signal of a downturn. Again, the inverted yield curve is not a timing mechanism, nor is it a 100-percent reliable recession indicator. 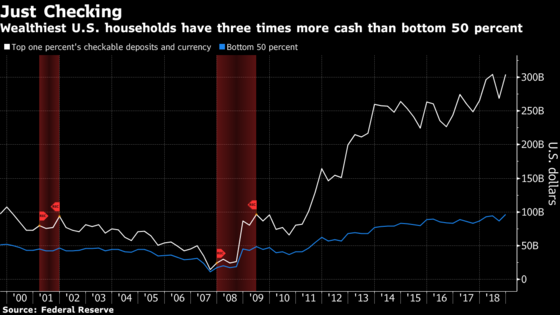 We also have a de-levered banking system and a de-levered high-net-worth population in the U.S.
America’s wealthiest households are stashing their cash at record levels. The top 1-percent of households now have three times more money in readily available cash than the bottom 50-percent holds! The 1-percenters have about 20-times more in cash today ($304 billion) than they did before the last recession ($15 billion) according to Federal Reserve data released last week. We are blessed to live during a dynamic time in U.S. history. 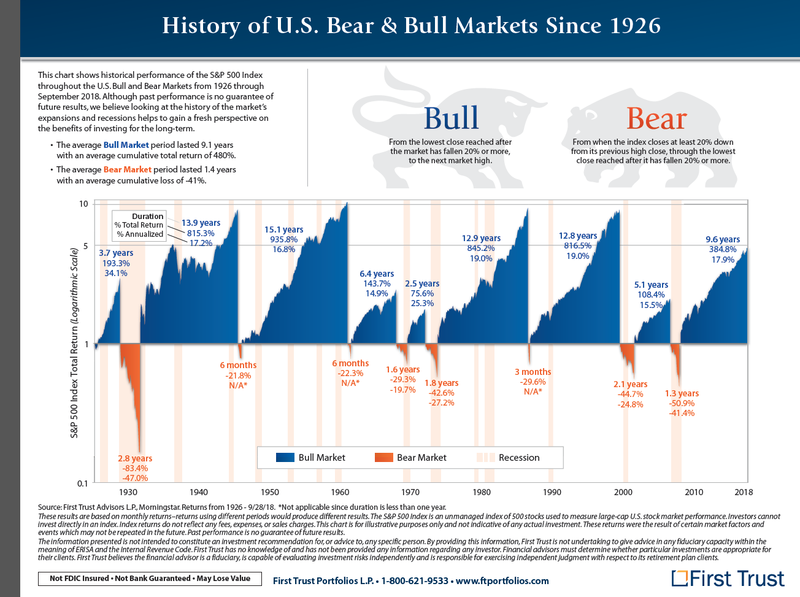 Bull markets are getting longer and bear markets are getting shorter. Most of us endured a once-in-a-lifetime recession in 2008, but came out with a record setting bull market run. When the the next recession arrives, it will most likely follow the same path as shown in the chart below. For investors who are net savers, over the next decade, you should welcome the recession as an opportunity to buy stocks on sale. I am a firm believer in Warren Buffett’s American Tailwind theory: “Over the next 77 years, however, the major source of our gains will almost certainly be provided by The American Tailwind. We are lucky-gloriously lucky-to have that force at our back,” quipped Buffet. Stick to your plan. Investing is a psychology game, not an IQ game. Do not get emotional and have a plan. Prepare for lower but acceptable returns. Ignore the headlines and doomsayers. Ignore politics as elections approach. Don’t lever up now. Opportunities will present themselves in the near future to use your debt/margin in a more efficient manner.